PLAY SCULPT LIVE: Fall is Falling! This Ironcraft challenge was to create something for fall the title is what struck me the most. I think it's quite clever. I chose to continue my quest of becoming a quilter with a little exercise quilt. I saw one made of triangles and thought it was intriguing so I picked this one for the challenge. My idea was to create movement in the piece so I placed the triangles at different angles making them look like they are "falling". It was quite a challenge for the triangles in the squares. I kept running out of fabric on one side of the triangles and had too much on the others. I still turned out kind of cool. When I look at it, my eye keeps moving from one triangle to the next which is what I wanted to accomplish. Of course, that's me. It's like reading your own short story, you can think it's brilliant but no one else gets it unless you explain it. I'd love comments and opinions. Thanks Lisa. It was fun to make. 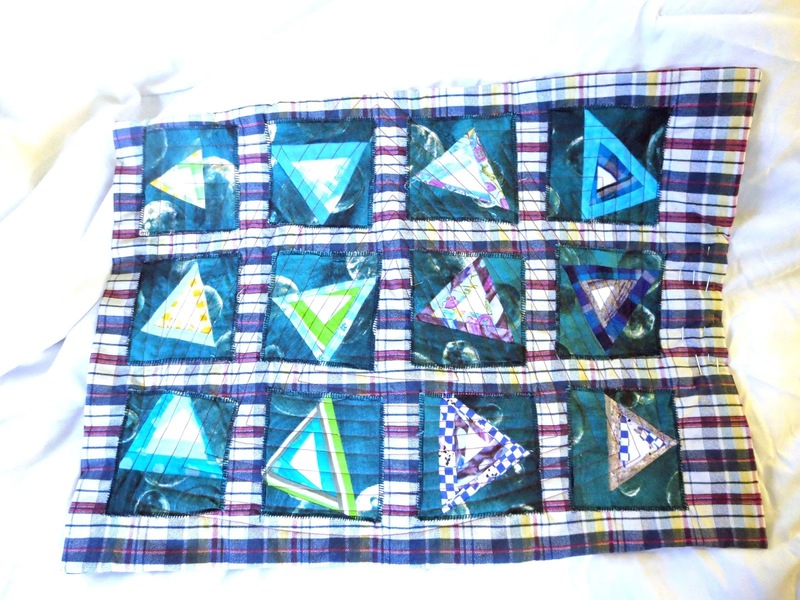 I think you definitely captured the falling movement with the triangles and the different angles and fabrics. Well done! Thank you Ros. Coming from a fellow quilter it's appreciated. I think it looks cool. I like modern quilts where everything isn't all perfectly square. How fun! 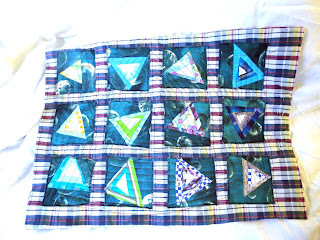 I love that you incorporated the triangle design into the quilting! Thanks Beth. I think I achieved what I wanted to do.